It’s a cold, blustery day out there. I walked to the store for some supplies, but was happy to be back inside again. Now it’s all about writing while listening to the cat snore. Every once in a while, the wind rattles the windows on the twenty-first floor and roars through the valley below, stripping the last of the leaves from the trees and sending them spiralling upward. When I’m not writing or knitting and finishing Battlestar Galactica, I’m catching up on my Feedly updates and trying not to be tempted by things I cannot even begin to afford on what I get on EI. Like this bottle of Samuel Adams’ Utopias. It’s seems hideously expensive at $115/bottle ($150 in the US), but after reading reviews what goes into making this rich sipping beer – hand selected malts and hops, aging in port and rum barrels for years – I was most curious about it. One of the observers at my beer class brought a spent bottle in to last night’s class, and even thought there was nothing left in it, the rich aromas of of caramel, figs and cherries that swirled from its depths cinched it. I can’t afford it now, but know that it’s on my bucket list in my more solvent future. 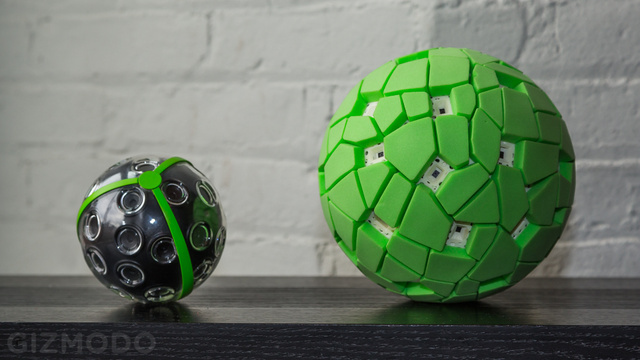 Or this, this is finally a thing – a throwable panoramic camera. While it would be super cool to have one, it’s not a bucket list item. Especially at $600. I made the super simple and elegant Marcella Hazan’s tomato sauce. Three ingredients – one 28oz can of good quality tomatoes (San Marzano is suggested, but I couldn’t find them), five tablespoons of butter and one onion, peeled and halved. Combine them and simmer together for 45 minutes to create something that is definitely more than the sum of it’s parts. So. Good.